Minnie Dlamini (born 7 July 1990), mononymously known as as Minnie, is a South African television and radio personality, actress and model. She rose to fame in 2010 after winning the for SABC 1's LIVE presenter search and began hosting that show alongside Bonang Matheba. Minnie Dlamini was born on 7 July 1990 in Durban, KwaZulu-Natal, South African. She is the only daughter of Jabulani Dlamini and Queen Dlamini. She is one of three children and the youngest to her parents. She has two older brothers; Maphe Dlamini and Khosini Dlamini. She attended Northlands Girls High School when she later matriculated and went on to enroll at the University of Cape Town where she initially studied Economics and Politics before switching to Film, Media, Drama and Economics. While studying at UCT Minnie Dlamini entered SABC 1'S LIVE presenter search and went on to be crowned a winner. She made her first public appearance for LIVE at Moretele Park in Mamelodi, Gauteng, covering [[Youth Day[[ and 2010 Fifa World Cup celebrations. While working at LIVE, Minnie Dlamini interned at Urban Brew Studios. In 2010 she had minor role role on Generations portraying the character of Miranda. In 2011 Minnie Dlamini began hosting Mzansi Insider alongside Phila Mazibuko. After the rumours of her resignation from LIVE the SABC had to fend off a controversy stating that she had not resigned but rather reassigned. "Minnie did not resign. We took a decision to move her to Mzansi Insider ­because Live has a new format which she won’t be needed for. We already have Bonang as the lead female and this new format only needs one female. However, City Press claimed to be om possession of Minnie Dlamini’s Resignation Letter dated November 30, 2011. Minnie Dlamini was later quoted by the City Press confirming that she had in fact resigned from that show "Yes, I did resign from Live to pursue my first love, which is acting. I never wanted to stay longer than two years at Live. I guess my decision was six months premature but I do feel like it’s my time (to leave)" . Minnie Dlamini quickly gained popularity from the onset, however, when she left LIVE she reportedly cited her love of acting as the main reason. In 2012 she joined a new M-Net soap opera, The Wild where she portrayed the character of Zintle Lebone, the daughter of businesswoman Marang Lebone, who was played by Connie Ferguson. Even with the star power, M-Net could not keep the show in the air is it struggled to gain traction. In 2013 she once again collaborated with Connie Ferguson, this time on a new Mzansi Magic drama series, Rockville where she portrayed the character of Nosipho Bogatsu. In 2012 Minnie Dlamini appeared as a guest judge on SABC 1’s Turn It Out and co-presented that year's edition of Miss South Africa. In 2013 Minnie Dlamini joined SABC 1's football highlights show, Soccerzone alongside Thomas Mlambo and Siphiwe Mkhonza. She held this role for nearly four years before resigning in 2016. "I have resigned from SABC Sport to focus on my other business ventures. I have loved my time with the SABC Sports family and will miss them dearly. It pains me to realize that I won't be seeing my Thom Thom (Thomas Mlambo) and Dr Mnandi every Monday as they have become family. I need to grow and explore various opportunities in entertainment and business. I'm super excited about 2017 and working very hard to make it a success. I will be back on screen for Tropika Island of Treasure Seychelles in March 2017 on SABC3, be sure not to miss it," Said Minnie Dlamini. And in 2017 she appeared on Tropika Island of Treasure Seychelles as the host. In May 2017 Minnie Dlamini began hosting a new sports show on Mzansi Magic, HomeGround alongside Lungile Radu. Minnie Dlamini's 2017 wedding was record and packaged by Gravitate and Beautiful Day Productions as an M-Net Original production for Vuzu Amp. A three part reality series wedding special, Minnie Dlamini: Becoming Mrs. Jones, went on air on Vuzu Amp from the 13th to the 27th October 2017. "I’m so proud of this series. From being the executive producer, to the high-quality resources we invested in the production and the incredibly talented creatives and crew we collaborated with. The result is this exquisite body of work that is an honest and visual representation of my heart during the most beautiful and intimate time of my life and I’m so thrilled to be able to share it with you," Minnie Dlamini of the show. In 2014, Minnie Dlamini founded the Minnie Dlamini Foundation, a charity organization established with the aim of helping young South African girls have access to good education. Minnie Dlamini was in a highly publicised on and off relationship with Kaizer Chiefs goalkeeper Itumeleng Khune. The pair eventually broke up for the last time amid rumours of infidelity. Minnie Dlamini would later remark in an interview, "I just wish I woke up sooner, that’s all. Not in a bad way". She went on to clarify that Itumeleng Khune never paid Lobola for her, this after rumours had linked her to a R1 million Lobola. "I was never ever lobolaed by a soccer player". Minnie Dlamini was romantically linked to Urban Brew producer Quinton Jones for a period of time. This was later confirmed; they pair has since gone on to get engaged, married and Minnie Dlamini is reportedly pregnant. The pair had been friends for many years before they started dating. Upon her engagement Minnie Dlamini shared a picture of herself holding a champagne glass and wearing a ring. This solicited an our pouring of congratulations and good wishes. "We are constantly laughing and making fun of each other but at the end of the day, wig off and no makeup, he still looks at me like I’m the most beautiful girl in the world. Quinton is very private and is not a fan of the limelight but has always been incredibly supportive of my career," Minnie Dlamini said of her then fiancé. 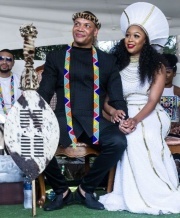 Minnie Dlamini and Quinton Jones had a traditional wedding ceremony held in Durban, KwaZulu-Natal. The white wedding took place at the Lourensford Wine Estate in Somerset West in Cape Town in the Western Cape. The wedding was record and packaged for television as a three part documentary which aired on Vuzu AMP to overwhelming acclaim. This page was last edited on 14 August 2018, at 02:29.